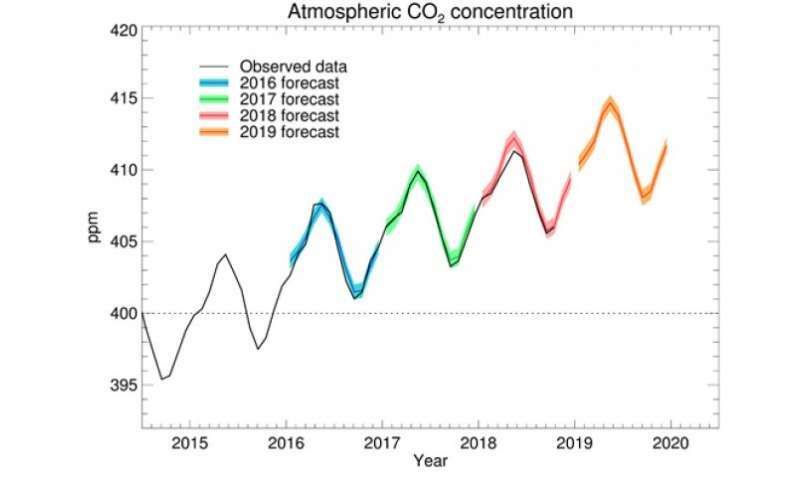 During 2019 Met Office climate scientists expect to see one of the largest rises in atmospheric carbon-dioxide concentration in 62 years of measurements. The Met Office CO2 forecast is based on a combination of factors including rising anthropogenic emissions and a relative reduction in the uptake of carbon-dioxide by ecosystems due to tropical climate variability. Professor Richard Betts of the Met Office Hadley Centre and the University of Exeter said: "Since 1958, monitoring at the Mauna Loa observatory in Hawaii has registered around a 30 per cent increase in the concentration of carbon-dioxide in the atmosphere. This is caused by emissions from fossil fuels, deforestation and cement production, and the increase would have been even larger if it were not for natural carbon sinks which soak up some of the excess CO2. This year we expect these carbon sinks to be relatively weak, so the impact of record high human-caused emissions will be larger than last year". The Met Office forecast suggests that the average rise in atmospheric CO₂ will be 2.75 ± 0.58 parts per million (ppm) higher in 2019 than in 2018. This figure would be among the largest annual rises on record, but less than those in 2015-2016 and 1997-1998 – years with El Niño events and hence large Pacific warming. In the first decade of measurements, the rise of atmospheric CO₂ was less than 0.9 ppm per year. The rise has since become generally faster over time as human emissions have increased, but with fluctuations related to climate swings such as El Niño. Professor Betts added: "The Mauna Loa graph of atmospheric CO₂ is a thing of beauty, but also a stark reminder of human impact on climate. Looking at the monthly figures, it's as if you can see the planet 'breathing' as the levels of carbon dioxide fall and rise with seasonal cycle of plant growth and decay in the northern hemisphere. But each year's CO2 is higher than the last, and this will keep happening until humans stop adding CO2 to the atmosphere. Testing our predictions of the details of this helps us improve our understanding of feedbacks in the climate system." The CO2 concentrations at Mauna Loa are measured by the Scripps Institution for Oceanography at UC San Diego and the National Oceanographic and Atmospheric Administration (NOAA). I can't help but wonder what climate change deniers think when they see the actual data reflecting the CO2 changes, temperature rises, and ocean level increases. How exactly could this be a hoax or anything other than real? Its like trying to explain that the sun isn't really rising from the east while watching a sunrise. While it is never a good gamble to bet against the depths of human stupidity, there has to be some sort of true mental blindness happening here that lies even beyond raw idiocy. Combine that with the horrific consequences inherent in the projected rapid changes to ecosystems and agricultural productivity around the globe, and people have to bleeding insane to trust their own fallible senses instead of the scientific consensus. I think I wish it weren't a fraud because I live in Alaska. Here, the land rises faster than the ocean as glaciers melt and stop pushing on the mountains. I could use another ten degrees warmth in winter, it would really bring down my heating bill, and summers are mild anyhow. What's more, with all the summer daylight we'd get yet another growing season out of cropland. Not to mention all that tundra (1/5 the size of the USA) turned into the next breadbasket of the world, unsullied by the warped economies of fiat/credit driven condo booms. This should be a message to all AGWites to lower their consumption to help prevent this from happening. Turn off you computers, turn down the heat, don't travel beyond walking/bicycling distance from your hole, no more meat or other high carbon foods. Have some dignity and start practising what you preach? This should be a message to all AGWites to lower their consumption to help prevent this from happening. Which makes failure to fix the problem the fault of those who express concern about it? Ironically those who do act that way don't get praised; they are seen as extremists who are not taken seriously - a lose-lose game the way opponents of climate action play it. This is not a problem that can be fixed by some people making a personal choice when others are left free to act irresponsibly - it needs institutional and regulatory change. It isn't about socialism or any kind of -ism, it is about responsibility and accountability, things that are compatible with free enterprise. When the price of energy reflects it's full and true costs we will choose low emissions over high. Wow! This is such a dire situation I'm surprised that governments around the world are not freaking out! I know the climate deniers would love to live in la-la land but their problem is the reality of the situation is very grave and the future is dark and hot. Dark because power generation will have to be stopped by military force unless it uses renewable fuel. particulates in air pollution completely ignored in climate models. The models aren't made for those still swinging the trees. Cantdrive Still can't drive, driving his wheelbarrow right into his own sockpuppet, it was quite a bang. Definitely not helping in the accumulation brain cells they so desperately needs. You snooze every time you try to make a rational thought, and always end up losing.... Again lol..
Definitely not helping in the accumulation brain cells they so desperately needs. I dont know anyone denying climate change, but appently you do, please name a few, that would make the discussion a lot more substantial. Who cares? CO2 is not a poison you meathead.